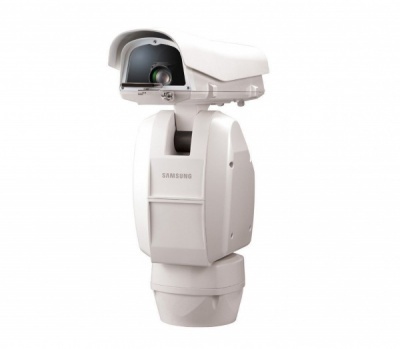 For exceptional video quality and amazing optical zoom, you can’t go wrong with the Samsung SCU-2370 600tvl Outdoor 37x zoom Day/Night PTZ Security Camera. It is among Samsung Techwin’s elite line of security cameras. Built with the IP66 rating casing, which is tough and weather-resistant, it has a built-in Powerful 37x zoom (3.5 ~ 129.5mm), 16x digital zoom, which allows the camera to capture clear images without compromising the image quality. The 600TVL (Color), 700TVL (B/W) will produce high resolution like you haven’t seen before and the minimum Illum: 0.2Lux at F1.6 (Color), 0.02Lux (B/W) doesn’t care if it is day or night, it records video even when it’s dark. Thanks to the True Day/Night with IR Cut Filter feature, it captures good image quality, no matter what the lighting is like. The camera includes exceptional features like SSNR (Samsung Super Noise Reduction), SSDR (Samsung Super Dynamic Range), HLC (Highlight Compensation), and DIS (Digital Image Stabilization) all of these are there to produce unmatched video quality you are going to really appreciate. This Samsung SCU-2370 600tvl Outdoor 37x zoom Day/Night PTZ Security Camera is a very unique piece of security equipment.